Have you ever studied anything out of Greek mythology? Have you heard of Achille and Achille’s heel? Achille was dipped in the waters of the River of Life, so his body would not be affected by any weapon. Unfortunately, his mother had held him down by heel of one foot, and that heel was not wetted by the holy water. Achille died when hit in that heel. Wiring is the dumbest part of a solar power set up, but it can act as the Achille’s heel of your system. What can go wrong with the dumb battery wiring in a solar system? Plenty of things. Most of them while you are wiring up or repairing. Here are some important points to keep in mind. Prepare a connections diagram for the total battery wiring, down to individual battery. People tend to skip this step but good engineers will not. Before you embark on a battery wiring mission, remove your watch, rings or any other metallic jewelry from your hands. Remove even non-metallic adornments which may entangle in the wiring or terminal posts. If you are wearing any necklaces etc. those may also touch the wiring if you have to bend over. Choose conductor sizes according to current levels. Under-rated conductors will cause losses and heat up. Plan the physical layout of battery wiring such that the connecters are as short as possible. Priority in this matter goes to those connectors which carry the most current. There is an acronym in engineering: KISS. This stands for “Keep It Simple, Stupid!” Replace the “simple” with “short” and remember it. The sweetness of a kiss should balance the harsh words! There are three reasons for keeping the connector lengths short. • Secondly, the increased resistance causes voltage drop and power loss, heating, etc. • Thirdly, too long wires may entangle while you are working on the equipment. While keeping the conductors short, do leave a margin. Such margin may be useful when replacing a damaged terminal or even when maneuvering space is required during removing a connection. Never use a connector cable so short that it just makes to the other end. Even vibration will damage something in the system. Ensure fast connections. Tighten connection properly. A loose or intermittent connection is probably the worst enemy of the electrical engineer. It is like a hit-and-run enemy. Intermittent connections in power circuits especially battery wiring can cause localized heating and even fire due to repeated arcing. While laying out the wiring there is generally a temptation to cross a conductor over another one for the sake of minimizing length. Avoid this. Localized overheating can cause the insulation to breakdown and cause a short-circuit and even fire. There is generally a need to combine batteries in series to obtain a desired string voltage. Strings are connected in parallel to obtain the desired current level. Here are some notes on series and parallel connections. A series connection of batteries means the same current passes along all the batteries. You may think of charge passing through battery after battery to reach the other end. (It is not technically accurate but good for understanding). It is just like a team plays a series of matches one after the other to reach the victory stand. The positive terminal of one battery is connected to the negative of the next one, and it goes on. In this way, negative of the first and the positive of the last act as the string terminals. The voltage across a series string is the sum of the individual voltages in the string. All batteries in a string should be identical in rating and performance. A bad battery in a string will affect the voltage of that string. 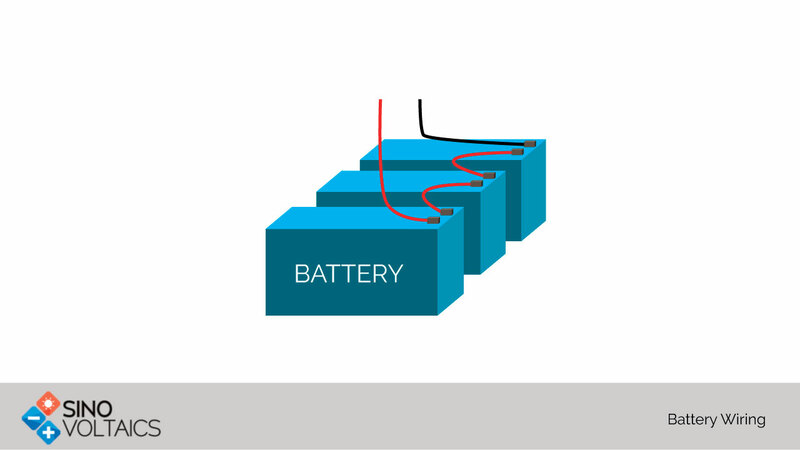 Such a battery can be identified by measuring the terminal voltages of individual batteries. A bad battery will be indicated a terminal voltage which differs significantly from specifications or other batteries in the string. The bus bar connecting a parallel combination of strings must offer equal resistance to each string so that all parallel paths get the same current and voltage. A string carrying too much current will be damaged soon. It is better to use identical leads conductors to each string.